YU Il-han was once a promising musical director, but he is now struggling hard making children's musicals in an effort to make a comeback following the failure of a big project he was in charge of. But one day, he gets a chance to go to Broadway. 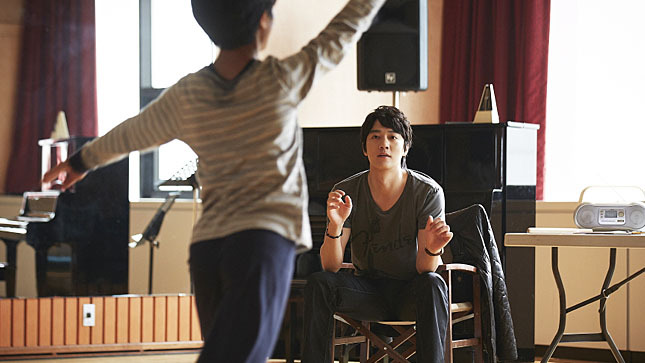 He forms a team with a child actor to join a musical audition program. With the ambition to win the audition with Young-kwang, who has an angelic voice, he restricts the boy’s freedom and trains him harshly. This is the right kind of film for the new year season. It's a touching drama full of the happiness and smiles that the man and the boy bring. Unwilling to admit his current status, the third-rate musical director YU Il-han dreams of a dramatic change in his life and joins a large scale musical audition program. The chances that his partner can win the audition are almost nil. They both try to achieve an almost impossible goal. The scenario of this film was the winner at the first edition of ‘CJ Azit-Project S’, a program by the CJ culture foundation to support new storytellers. The uncommon setting of the protagonist’s challenge for win an audition and the typically amusing elements of the musical genre will appeal to audiences. The transition of the musical director from a goal oriented person to a different character after he meets an innocent prodigy is quite engaging. The audition process, the crux of the film, follows the two charcaters who seem destined to lose as they approach their miraculous goal. The film is certain to bring happiness and hope in the beginning of 2013. KIM Rae-won actually plays the piano in A Wonderful Moment, the first film he chose after being dismissed from his military service. The new actor JI Dae-han, who plays his partner. JI, as a boy from a multi-cultural family, was selected out of 800 candidates who applied for a nationwide audition. Along with the dance and musical aspects of the audition program, various characters and events are peppered throughout the film's delicate structure. The heartwarming soundtrack includes ‘Tomorrow’, the theme of a well know musical piece ‘Annie’, which only adds to the beautiful story. The director KIM Seong-hun expressed his intention by saying, “Someone living an ordinary yet diligent life can be a true hero and bring hope to someone else. I wanted to say such a kind of people deserves to be praised.” The scenario was adapted by HWANG Jo-yun, the script writer of Masquerade.